All best books electrical mechanical and civil for SSC JE part -2 main conventional exam 2017.In this post I provide books for hindi and English medium students. This post give you all best books for all SSC JE main exam 2018 all engineering branches electrical, mechanical and civil engineering. 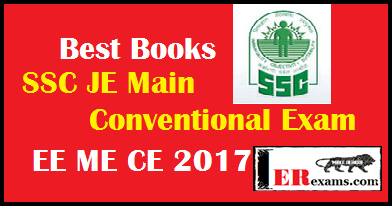 Many of students who are qualify ssc je exam 2017 wants best and useful books for study for crack this exam in one attempts. The all books here I am suggest you are best and very useful for convectional papers. The all books here suggest by previous ssc je main exam qualify students and best coaching institute teacher and my research team. So buy the all books online or buy near your book seller. I hope this post help you crack your SSC JE exam 2018.if find this article useful for you please share with your friends too. Get latest update erexams.com in your email inbox subscribe us.